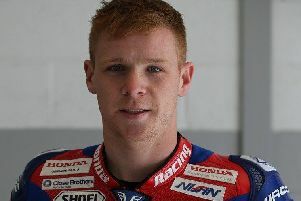 Motorcycle racer Mikey Large-Taylor has again been in British Junior Supersport Championship action at Silverstone and Oulton Park. The first meeting took place on Silverstone’s National circuit layout after problems encountered with the rain and track surface at the previous weekend’s British MotoGP. The Keelby rider was sixth-fastest in free practice, qualified in ninth place and went on to finish in a good points-scoring eighth position in each of the two races. Mikey again qualified strongly at Oulton Park last weekend. After a wet free practice session, an improvement in the weather allowed him to go 10 seconds quicker in qualifying, and lined up place on the starting grid. In the first race he again finished eighth, but then suffered his first non-finish of the season in the second. Despite the DNF he has now amassed 107 points and lies ninth in the championship, with seventh place within his sights going into the final round at Brands Hatch on the weekend of October 12 to 14.